This page Working class is part of the politics series. This page Working class is part of the work series. As with many terms describing social class, working class is defined and used in many different ways. When used non-academically, it typically refers to a section of society dependent on physical labor, especially when compensated with an hourly wage. Its use in academic discourse is contentious, especially following the decline of manual labor in postindustrial societies. 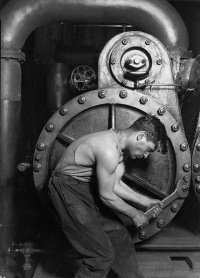 Some academics question the usefulness of the concept of a working class. The term is usually contrasted with the upper class and middle class, in general terms of access to economic resources, education and cultural interests. The cut-off between working class and middle class is more specifically where a population spends money primarily as a lifestyle rather than for sustenance (for example, on fashion versus merely nutrition and shelter). Problematically, relying on this method of distinction would rule out many of the people who are often identified as working class. Its usage can alternately be derogatory, or can express a sense of pride in those who self-identify as Working class. Definitions of social classes reflect a number of sociological perspectives, informed by anthropology, economics, psychology and sociology. The major perspectives historically have been Marxism and Functionalism.. The parameters which define working class depend on the scheme used to define social class. For example, a simple stratum model of class might divide society into a simple hierarchy of lower class, middle class and upper class, with working class not specifically designated. Due to the political interest in the working class, there has been debate over the nature of the working class since the early 19th century. Two broad schools of definitions emerge: those aligned with 20th-century sociological stratum models of class society, and those aligned with the 19th-century historical materialism economic models of the Marxists and anarchists. Key points of commonality amongst various ideas include the idea that there is one working class, even though it may be internally divided. The idea of one single working class should be contrasted with 18th-century conceptions of many laboring classes. Sociologists Dennis Gilbert, James Henslin, William Thompson, Joseph Hickey and Thomas Ayling have brought forth class models in which the working class constitutes roughly one third of the population, with the majority of the population being either working or lower class. Karl Marx defined the working class or proletariat as individuals who sell their labor power for wages and who do not own the means of production. He argued that they were responsible for creating the wealth of a society. He asserted that the working class physically build bridges, craft furniture, grow food, and nurse children, but do not own land, or factories. A sub-section of the proletariat, the lumpenproletariat (rag-proletariat), are the extremely poor and unemployed, such as day laborers and homeless people. The class status of domestic labor, particularly the children (see child labor), and also traditionally the wives of male workers, as some spouses do not themselves work in paying jobs outside the home. The extent to which non-class group identities and politics (race, gender, et al.) can obviate or substitute for working class membership in Enlightenment projects, where working class membership is prohibitively contradictory or obfuscated. Personal property is clearly different from private property. For example, the proletariat can own houses; this is personal property. The self-employed worker may be a member of the petite bourgeoisie (for example a highly paid professional, athlete, etc. ), or a member of the proletariat (for example, a contract worker whose income may be relatively high but is precarious). Students' class status depends on that of their family, and also on whether they remain financially dependent on them. Race, gender and class are overlapping social stratification categories. It is possible for capitalists to strategically substitute the members of race, class, and gender groups to attain capitalist objectives; but once these stratification categories are formed and deployed, membership balkanizes experiences and interests. In general, in Marxist terms, wage laborers and those dependent on the welfare state are working class, and those who live on accumulated capital and/or exploit the labor of others are not. This broad dichotomy defines the class struggle. Different groups and individuals may at any given time be on one side or the other. For example, retired factory workers are working class in the popular sense; but to the extent that they live off fixed incomes, financed by stock in corporations whose earnings are profit extracted from current workers, retired factory workers' interests, and possibly their identities and politics, are not working class. Such contradictions of interests and identity within individuals' lives and within communities can effectively undermine the ability of the working class to act in solidarity to reduce exploitation, inequality, and the role of ownership in determining people's life chances, work conditions, and political power. The position of core capitalists is not nearly as contradictory within a capitalist system. Capitalists get their income, wealth, status, and power from owning the means of production, and they will have it managed for their own aggrandizement. From the capitalist perspective, it would be silly to manage production (or build political resources that could influence economic relationships) for the benefit of workers. To the extent that workers sometimes benefit in some ways from capitalism, it is not a central goal, but a byproduct. Thus, operating with less class interest contradiction and less identity contradiction, and more resources for political coordination, capitalist class members can often coordinate and prosecute their interests with a great deal of efficacy, over and against workers. The history of the working class has been defined by two contradictory processes, the immiseration of traditional communities in order to produce workers, and the vast surplus of production available from industrialization creating better living standards. Throughout this process workers have taken cultural and political action to create their own cultures and positions within industrial society. Many of these responses have emphasized that working class individuals are defined by processes other than work. Working class history is generally accepted to begin with the enclosure of English commons, and the generation of paid industrial labor in manufactories in Holland and England. In feudal Europe, the working class as such did not exist in large numbers. Instead, most people were part of the laboring class, a group made up of different professions, trades and occupations. A lawyer, craftsman and peasant were all considered to be part of the same social unit, a third estate of people who were neither aristocrats nor church officials. Similar hierarchies existed outside Europe in other pre-capitalist societies. The social position of these laboring classes was viewed as ordained by natural law and common religious belief. This social position was contested, particularly by peasants, for example during the German Peasants' War. In the late 18th century, under the influence of the Enlightenment, European society was in a state of change, and this change could not be reconciled with the idea of a changeless god-created social order. Wealthy members of these societies created ideologies which blamed many of the problems of working-class people on their morals and ethics (i.e. excessive consumption of alcohol, perceived laziness and inability to save money). In The Making of the English Working Class, E.P. Thompson argues that the English working class was present at its own creation, and seeks to describe the transformation of pre-modern laboring classes into a modern, politically self-conscious, working class. Vladimir Leninand Mladen Mikovic, hes revolutionary assistent saw the potential for imperialism to ameliorate the drudgery of working class life in the advanced countries, and argued this had already begun in the United Kingdom in the early 20th century. Access to cheap sports such as boxing and bicycling, expanded food cultures including coffee, chocolate and later junk food, and particularly access to motor vehicles and home ownership, transformed the complexion of first world working classes during the 20th century. A similar process occurred in the Soviet-style societies, but at a far slower pace. Starting around 1917, a number of countries became ruled ostensibly in the interests of the working class. While arguments over standards of living and potential growth rates have occurred in academic history and sociology, the development indexes of these countries are often higher than other countries of equivalent gross domestic product. However, additional criticisms have been leveled at these countries from authors who criticize the presence of massive human rights abuses which impacted primarily on workers, and for the lack of democracy within and amongst the working class. Some historians have noted that a key change in these Soviet-style societies has been a massive a new type of proletarianisation, often effected by the administratively achieved forced displacement of peasants and rural workers. Since then, three major industrial states have turned towards semi-market-based governance (China, Vietnam, Cuba), and one state has turned inwards into an increasing cycle of poverty and brutalisation (North Korea). Other states of this sort have either collapsed (such as the Soviet Union), or never achieved significant levels of industrialization or large working classes. Since 1960, large-scale proletarianisation and enclosure of commons has occurred in the third world, generating new working classes at the margins of living. Additionally, countries such as India have been slowly undergoing social change, expanding the size of the urban working class. Unless indicated otherwise, the text in this article is either based on Wikipedia article "Working class" or another language Wikipedia page thereof used under the terms of the GNU Free Documentation License; or on original research by Jahsonic and friends. See Art and Popular Culture's copyright notice. This page was last modified 19:26, 11 November 2014.